Sisters Venus and Serena Williams have once again proven that age is no barrier as the pair remain the headline acts in the women's game, especially at Wimbledon on women's quarter-finals day. At 36, Venus is the oldest quarter-finalist in the ladies' singles at SW19 for 22 years, while Serena, 34, found her form on Monday to reach the last eight. They are in opposite sides of the draw so could only play each other if they were to reach the final. Here is what you should not miss on day eight at Wimbledon. Her match against Russia's Anastasia Pavlyuchenkova will be defending champion Serena's third in as many days. There were straight-set wins on Sunday and Monday and the top seed - who hit 43 winners and made just 14 unforced errors in beating Svetlana Kuznetsova in the last 16 - will be confident of more of the same on Tuesday. Six-time champion Williams has beaten Russia's Pavlyuchenkova, the world number 23, in all five of their previous encounters and finished her match against two-time Grand Slam champion Kuznetsova in style, winning nine games on the trot. The world number one, in her 12th Wimbledon quarter-final, will take on Pavlyuchenkova on Centre Court at about 15:00 BST. At 3-0 down in the first set against Carla Suarez Navarro, Venus looked in trouble but the five-time champion dug deep to win in straight sets, reaching the last eight for the first time since 2010. In beating Spain's Suarez Navarro Venus, at 36, also becomes the oldest quarter-finalist in the ladies' singles at Wimbledon for 22 years. Blocking the eighth seed's path to the semi-finals is Yaroslava Shvedova of Kazakhstan - a player 88 places below her in the world rankings and one whom she has never played before. When it was put to her that some people would not expect her to be at this stage at Wimbledon, Venus said: "I think the toughest critic is always yourself in any case. If anyone's hard on me, I'm harder than anyone out there. "But I don't really care. How about that? I have a job to do on the court. There are very few people that can get out here and play at this level." Williams and Shvedova start the day on Court One at 13:00 BST. Dominika Cibulkova thrilled court three on Monday as she beat 2012 finalist Agnieszka Radwanska 6-3 5-7 9-7 in a brilliant duel which lasted three hours. Has the 19th seed enough left in the tank to overcome Russia's Elena Vesnina? Should the Slovakian win she will have to postpone her wedding, which is due to take place the day of the Wimbledon final. "If I would win then we will change it," said the 27-year-old, who is due to marry her fiance, Michal Navara, in Bratislava. Cibulkova's wedding guests will be watching closely when she takes on Vesnina on Court One at about 15:00 BST. Australian Open champion Angelique Kerber should be fresh after needing just 64 minutes to see off Japan's Misaki Doi 6-3 6-1 in the last 16. Germany's Kerber, the fourth seed, has already won a Grand Slam this year, but has only beaten her last-eight opponent Simona Halep once in four attempts. The pair kick off proceedings on Centre Court at 13:00 BST. Lindsay Davenport, the 1999 Wimbledon champion, believes Pavlyuchenkova will be up against it on Tuesday. 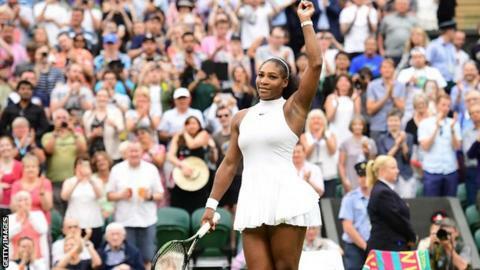 "If you had asked Serena before the tournament that to get to a Wimbledon final she'd have to beat Pavlyuchenkova, and then either Cibulkova or Vesnina, she would have said 'sign me up'," the American told BBC Sport. "She knows she still has to play the matches but if you look at those players, and Serena's game on grass, they don't add up. "Pavlyuchenkova doesn't move well enough to be able to get any balls back. You have to play a nice mix of offence and defence against Serena and defence is Pavlyuchenkova's biggest weakness. "Simona Halep versus Angelique Kerber will be an amazing match. Neither one may be that comfortable on grass but they both play streetfighter tennis. Both get a lot of balls back into play and move well. "Serve isn't a weapon for either player so both will have to work hard. Halep had to work much harder on Monday in beating Madison Keys, while Kerber spent an hour in her match. We'll see if that is a factor."